PanScan RT PanScan RT (room temperature) Systems and Subsystems are. 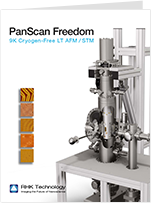 PanScan RT (room temperature) Systems and Subsystems are available as UHV platforms and also economical Ambient configurations. 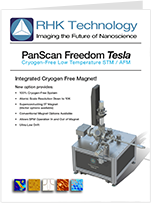 PanScan UHV and Ambient RT SPMs offer your choice of dedicated STM-only or STM/AFM-qPlus modes. 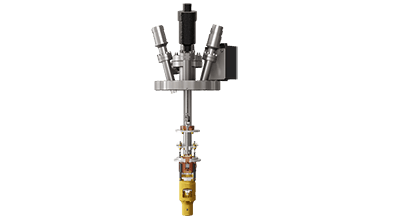 UHV RT PanScans include the SPM chamber, load lock, and options for integrated Prep/Analysis chambers and top instruments, along with UHV pumping, gauging and bake-out equipment. Like UHV LT models, UHV RT models include the same highly effective eddy-current damped spring suspension; 4 ports for in-situ deposition; ability to change tip and sample independently and easily; and UHV storage racks for convenient tip/sample treatment and quick access. Ambient PanScans include a Lexan plastic enclosure for mounting the flange-based scan head assembly and vibration isolation in air. This compact package provides easy convenient desktop or air table use. 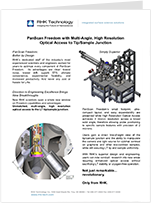 Both UHV and Ambient packages provide a versatile nanotech research instrument, as well as a straightforward, economical upgrade path to LT Flow or LT Freedom capabilities when research objectives change.